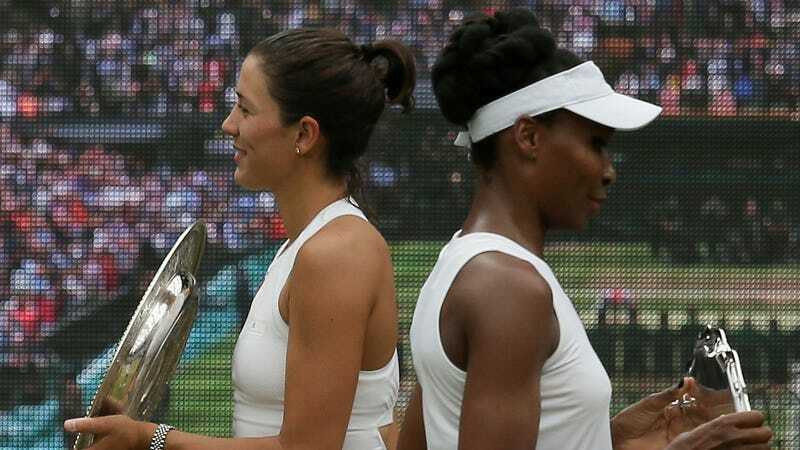 Five-time Wimbledon champion Venus Williams lost to Garbiñe Muguruza in the final today and for Williams, her team, and fans of good tennis, dynasties, and greatness, it sucked. But not nearly as much the sickly-sweet, smarm-drenched “there’s no losers here” takes that make a tennis legend and cultural icon seem like a 10-year-old. Williams mostly coasted through the tournament and looked poised for another title at the All England Club, which her devoted fans (*raises hand*) eagerly awaited. Then, in the first set, she botched two set points to lose 7-5, and totally fell apart in the second, stumbling to a shocking 6-0 loss. She lost eight straight games. In the second set, she had 10 unforced errors and only won 12 points. By any measure, it is fair to say she fell apart. Actually Venus Williams is the loser today. She didn’t blame her age or her autoimmune disorder or anything else and she certainly doesn’t need smarmy sports reporters to make excuses for her. And she definitely doesn’t need anyone to “let it be known” that she’s still a champion. Not only is she a champion, she’s 37! She can handle people accurately reporting that she played some very bad tennis today. “Falling apart” doesn’t imply mental frailty, it means she fell apart. She could have tweaked a muscle, gotten tired, or lost her mental focus on the biggest stage in tennis under intense pressure. It happens! And there’s nothing wrong with saying that. Venus Williams will be back in another final soon, and she’ll probably win it. She can hold on to that. You all can hold on to your saccharine sentiments.